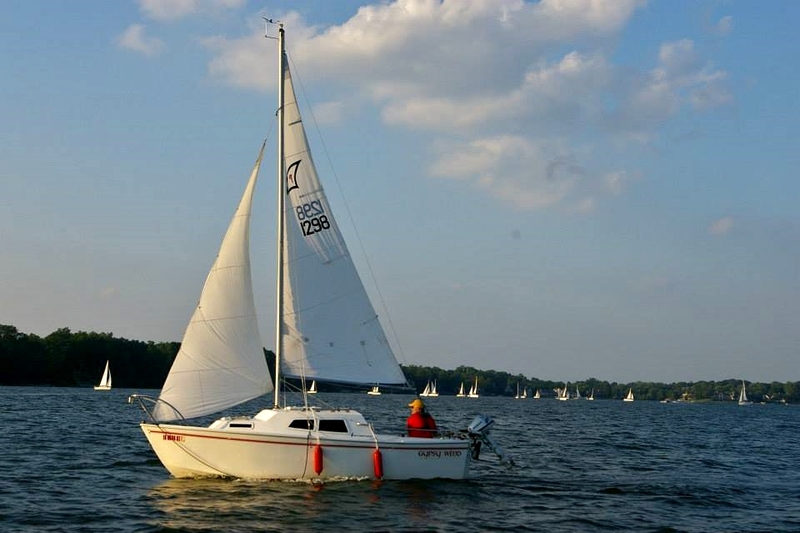 Gypsy Wind out for an evening sail at the Indianapolis Sailing Club. Photo by Christopher Palabrica. As I sail my little West Wight Potter on the 2.9 square miles of Geist Reservoir, I dream of bigger things. I long to dip my rudder in the 139 million square miles of earth’s oceans. Lacking significant wealth, and being too soft for the cruising vagabond lifestyle, I sail the seven seas from the comfort of my recliner, with an endless supply of books written by ocean-cruising sailors. There is much to be learned from these writers: How to survive storms, lousy food, blown out sails, faulty navigation equipment, and fractured masts. Then there are the harrowing tales of those left adrift, struggling to survive thirst, hunger, and foul weather for days, weeks or months. But, if I’ve learned anything from this vicarious cruising, it is this: Never, ever, set sail with a writer. That’s not to say writers make bad sailors. Joshua Slocum was the first to sail single-handedly around the world. He was either a good sailor or exceedingly lucky. But he sailed alone. Give him a crew, and his book likely would have been titled: Sailing with Nitwits Around the World. So, we write to figure things out. For some of us, that also is why we sail. And, that is why it is dangerous to set sail with a writer. Writers think out loud … or at least in published accounts … and that can include what they think of you. Consider of Richard Henry Dana and Two Years before the Mast. Or, Thomas Nickerson’s account of the survival (by cannibalism) of the crew of the sunken whaleship Essex. The truth is I like sailing books with blunt assessments of a crew and the writer’s own shortcomings. And that’s precisely what you get in Glenn Damato’s Breaking Seas. I received it as a Christmas gift and could not put it down. But I was astonished by Damato’s malicious description of new crew member, Megan. Megan was a big girl – and I mean big. Not simply overweight, but wholly obese. Huge. I could see that she was also plain and, well, masculine in her bearing and appearance. I knew straight out, from the moment I first saw her, there was no possibility of Megan and I ever having any sort of physical relationship – at any point in the future, no matter what. Ever. I felt as attracted to her as I would another man. Damato is equally as harsh in his description of himself as an overweight, middle-aged computer nerd, frustrated in his desire to find and marry a stunningly beautiful woman. Then there is the case of crew discord described by David Mercy in his Berserk: My Voyage to the Antarctic in a Twenty-Seven-Foot Sailboat. With Skipper Jarle Andhøy, Mercy set sail for the Antarctic with, Manuel, a new friend and equally green crew member. When the sparks fly in crowded, cold, wet conditions, you can count on the writer – Mercy – to have the last word. Sailing with a writer is not always a bad experience. Sail with Bob Bitchin, and you’re sure to have a wild and wonderful time. But, you can count on that great time becoming fodder for his extroverted, fun-loving muse. Among the more tame anecdotes in his book Letters from the Lost Soul is his description of seasickness and the Knapp family. Now I may not have mentioned it, but Shawn, his brother, and cousin Dan, all have the same last name. Knapp. As the passage progressed we learned that this name was quite auspicious. The family must have been named for what they do best, nap. I haven’t seen people sleep so much since they invented C-Span! When not on watch, these guys made Rip Van Winkle look like an insomniac. Of course the second day out we made a discovery. It seems that brother Jim has a tendency toward seasickness. At first he thought he was going to die. Then, a little later he was afraid he might not! That was worse. By the end of day two he looked like King Kong, strapped to the foredeck so he wouldn’t fall off, and practicing for the next Olympics in the projectile spewing category. After a couple of days, when all he had left to throw up were his toenails, we took pity on him and gave him an injection of some super juice our friend Dr. Jeff gave us, and for the rest of the trip he did his best Shawn imitation. He slept. As did Cousin Dan. No doubt about it, Knapp is the ancient Greco-Roman spelling for nap, and this family perfected it. So there you have it. While I recommend never sailing with a writer, I am one. Perhaps that’s why I single-hand most of the time. If you want to crew on Gypsy Wind, I can’t guarantee you’ll make the blog, but it may be worth a try.